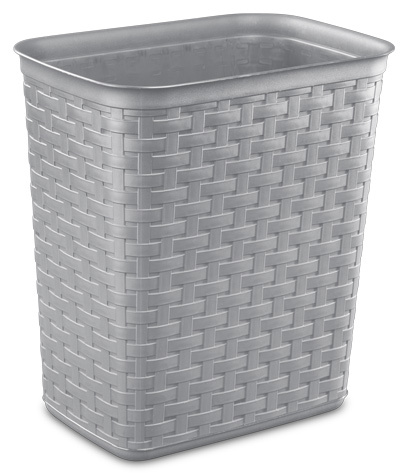 The 3.4 Gallon Weave Wastebasket is ideal for adding a decorative touch to any office, bedroom or bathroom. The weave pattern adds a fashionable element and complements any home décor, and takes on the appearance of furniture. The sleek profile and space efficient shape easily fits into small spaces throughout the home. It's durable design will hold up to regular day-to-day use and confidently conceal contents. Weave styling mimics current trends while offering easy to clean, durable and snag proof material, unlike natural fibers. 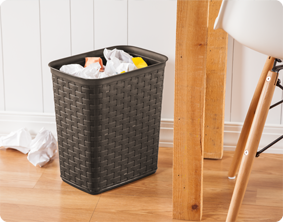 This wastebasket can be lined with a standard sized shopping bag or be used to collect recyclables. The overall dimensions of this item are 11 1/2" L x 8" W x 12 5/8" H.
Decorative weave pattern complements any room in the home. 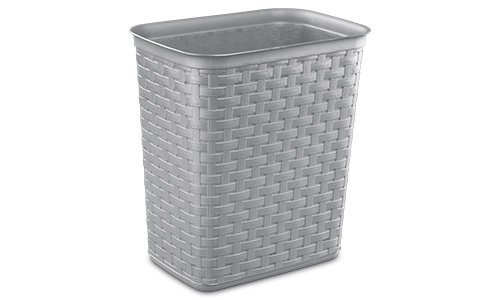 3.4 Gallon Weave Wastebasket is rated 5.0 out of 5 by 2. Rated 5 out of 5 by Shaugs13 from Awesome products Love how easy it is to keep clean and how well it fits my style. Rated 5 out of 5 by la from Expensive looking I love the look of this wastebasket. The brown color and the weave pattern make it look expensive. Very durable and sleek for any room!